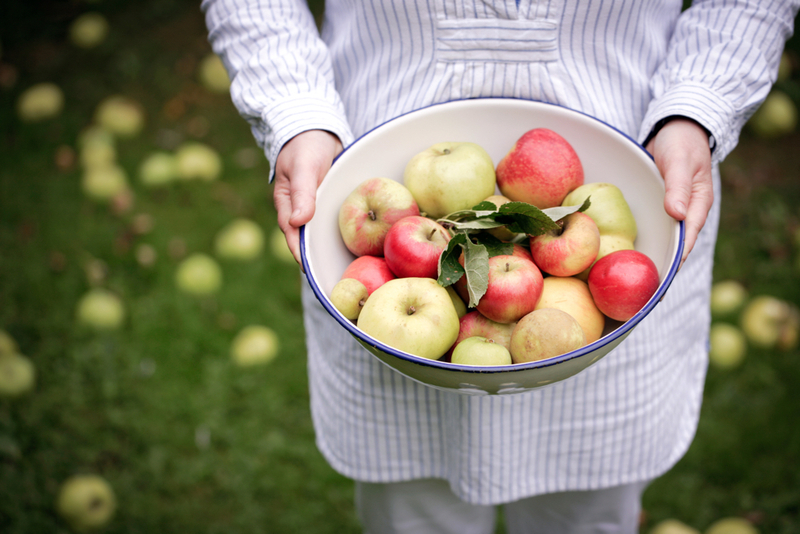 ABOVE: SILVANA HOLDS A BOWL FILLED WITH A HARVEST OF FRESH APPLES. PHOTOGRAPH BY JASON INGRAM. As evidenced by the name of her online journal and shop, The Foodie Bugle, Silvana de Soissons likes to shout — in the nicest way possible, of course — about artisan food and her adopted hometown of Bath, England. Born and raised in Eritrea of Italian descent, Silvana created The Foodie Bugle blog in March 2011 to write about artisan food production, focusing on ordinary people and their wares. The following year, The Foodie Bugle won The Guild of Food Writers New Media Award, which garnered her a great deal of attention. Through social media, Silvana’s digital bugle if you like, her readers told her they wanted a print edition. She complied and published Reveille 1 and Reveille 2. 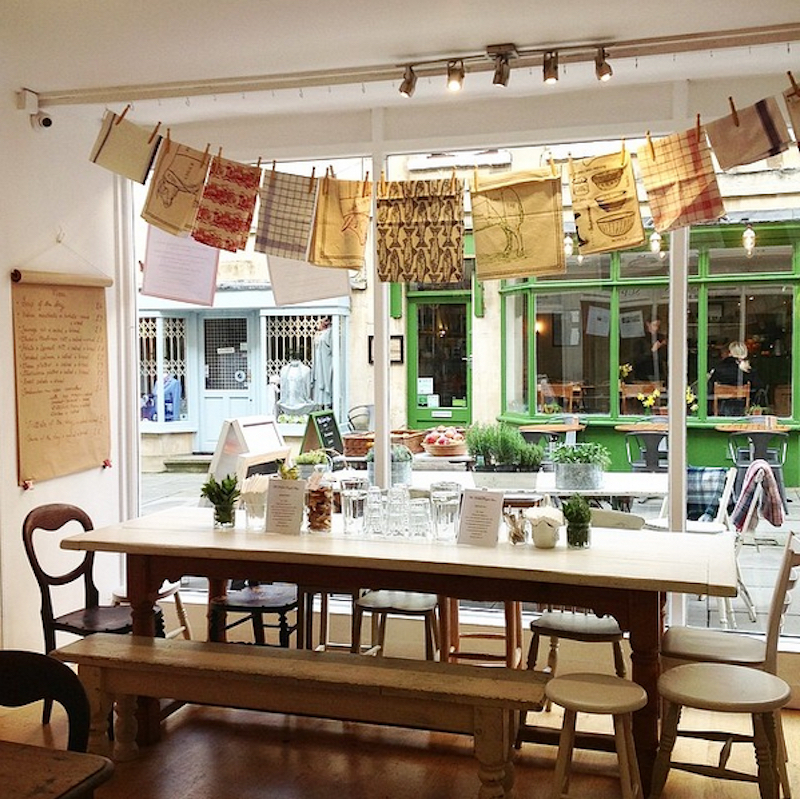 Feeling their hunger for more, she tested the concept of a Foodie Bugle shop with a pop-up in her home and soon after in December 2014, she opened her bricks and mortar shop on Margaret Street in Bath — only 3 ½ years after starting the blog. Tireless and always in good humour, we recently caught up with Silvana to look behind the scenes at her success story and how her digital bugle has enabled her to shout her message around the world. With over 22.5K followers on Instagram and Twitter, we are also delighted that she is sharing her personal social media tips with us. Thank you, Silvana. ABOVE: THE FOODIE BUGLE SHOP FRONT AT 7 MARGARET’S BUILDINGS IN BATH. PHOTOGRAPH BY JASON INGRAM. FF – How did you first become interested in food? S dS – When I was a small child my Lombard parents once took me to the food shop Peck in Milan. There from the ceilings hung prosciutti, on wall to wall shelves sat plump wheels of cheese, tall jars of artichokes in oil, metal tins of Cannellini beans, slender bottles of olive oil and terracotta vats of olives, capers and anchovies. My three year old’s eyes were wide open and could scarcely take it all in. 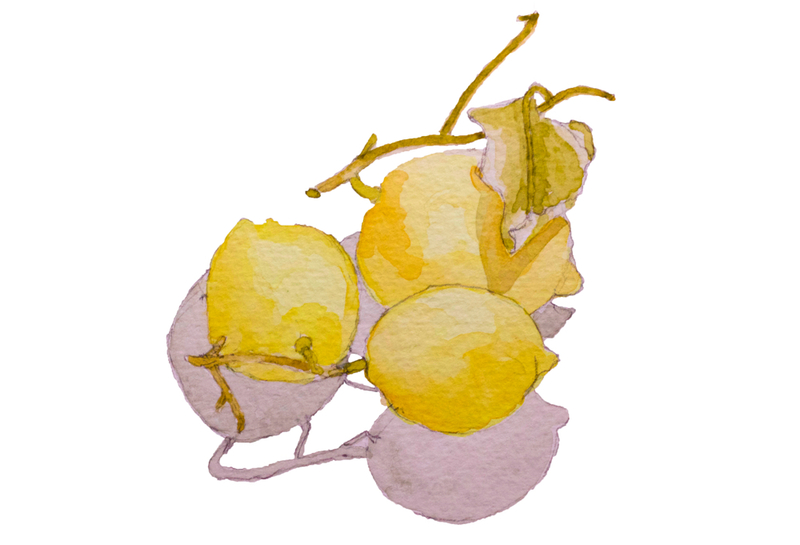 The smell of fresh Amalfi lemons, Sicilian blood oranges, San Marzano tomatoes and ripe peaches stayed with me — I was born in an Italian family where fresh, simple, homemade food was very important every day, and it is no wonder that I pursued a career in food. FF – What does food mean to you? S dS – Food is everything – it is the holistic tapestry that holds the threads of life together. Sharing good food, looking after your body, looking after the environment, eating well and safeguarding farming’s future – surely these tenets are central to the fundamentals of life, culture and society? 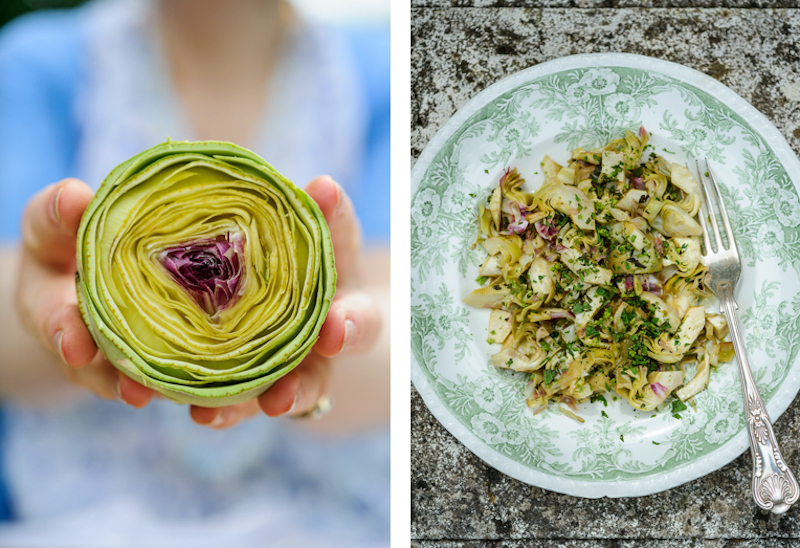 ABOVE L & R: AN ARTICHOKE — BEFORE AND AFTER. PHOTOGRAPHS BY JASON INGRAM FOR THE ENGLISH GARDEN MAGAZINE. FF – Please tell us about Eritrea and how your family came to live there from Italy? S dS – My family came to live in Eritrea after the first world war – my Mamma’s family is from Milano and my Papa’s family is from Bergamo. The Italians colonised Eritrea and there was a large community of farmers there. Asmara, the main city where we lived, was known as Little Italy. My father was in sugar farming and my Mamma is a really excellent cook – it was from her that I inherited a great love of cooking and fresh ingredients. FF – When and why did you come to the UK? I came to the UK thirty-five years ago to study Economics at Bath University. It was a great shock to go from a hot continent with bright blue skies and have avocados growing in your garden and mangoes for tea, to a country where it is winter nine months of the year and the main diet is root crops and beef! 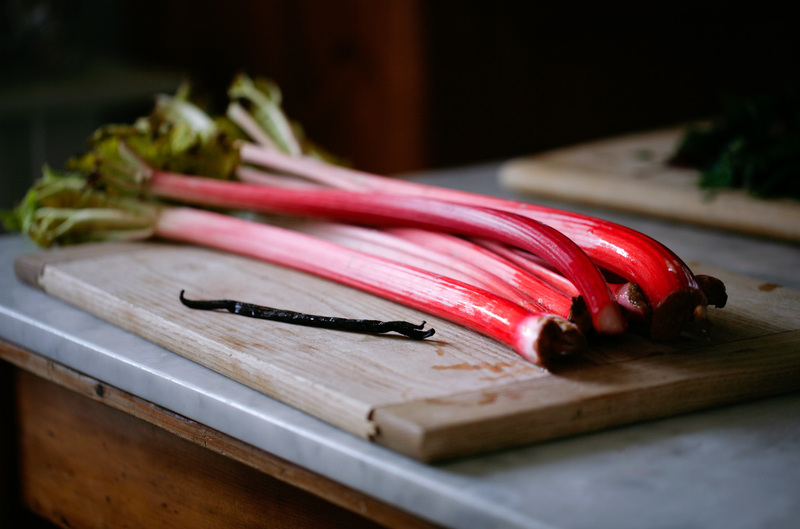 ABOVE: FORCED RHUBARB FROM START TO FINISH. TOP PHOTOGRAPH BY JUSTIN INGRAM. BOTTOM PHOTOGRAPHS BY THE FOODIE BUGLE. FF – What did you do after university? S dS – After university, I decided to work, very briefly, in the City. Everyone in the mid-1980s was going into banking. I hated it, but they gave me an expense account to take customers out to eat and so I dined in the some of the best places in London. Learning about new types of food and gastronomy was inspiring. After that, I worked as a food writer, cookery teacher and food stylist, as well as a private caterer. I started to become very interested in small artisan food production and the slow food movement. It was this interest that led me to start The Foodie Bugle. 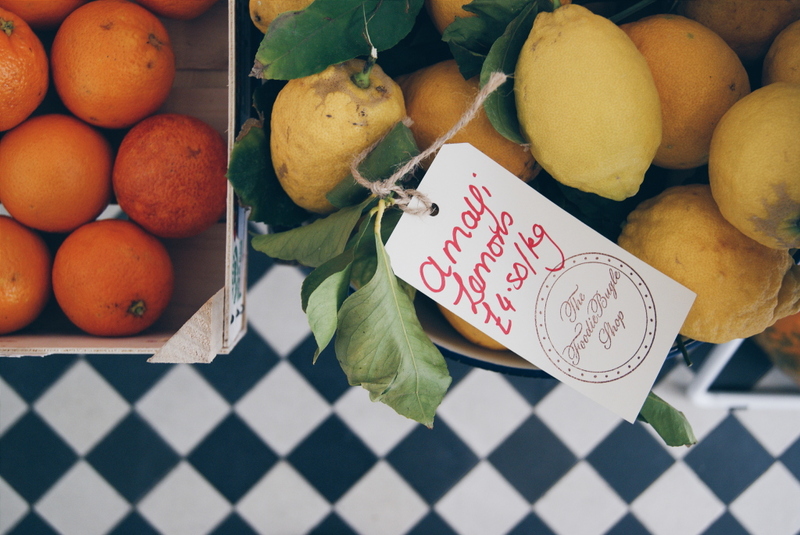 ABOVE: SILVANA’S FAVOURITE AMALFI LEMONS. PHOTOGRAPH BY GOTTA KEEP MOVIN’. FF – What was your intention in starting The Foodie Bugle? S dS – Cooking is treated as a competitive sport by the TV channels and so much of food writing is London-centric – so I wanted a blog that featured ordinary people making extraordinary food in rural areas and also abroad. 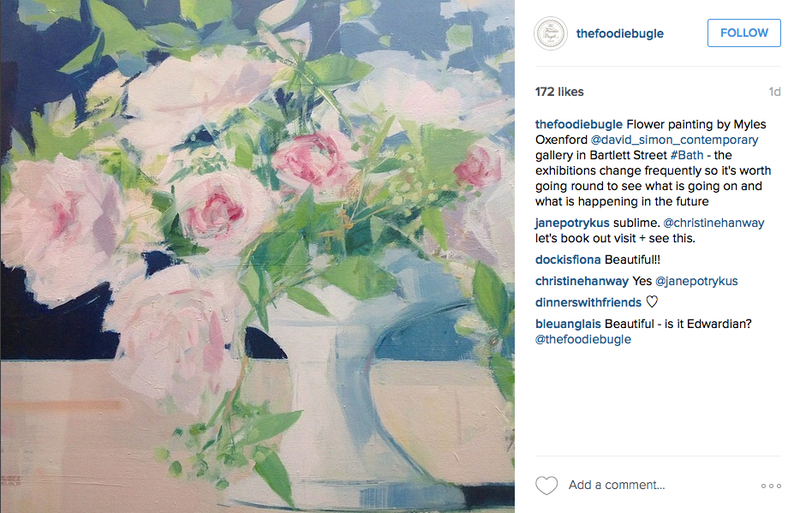 FF – What are the three best things about starting The Foodie Bugle? S dS – Meeting talented artisan suppliers, eating the best food and drinking the best coffee, and working for myself. ABOVE: THE SHOP OFFERS RELAXED COMMUNAL DINING. PHOTOGRAPH BY THE FOODIE BUGLE. 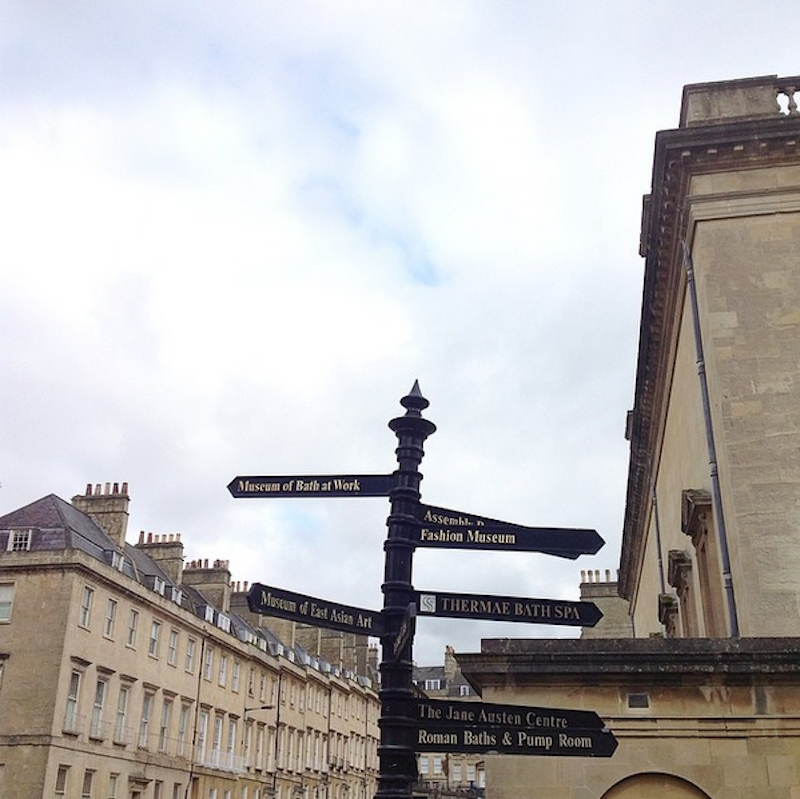 FF – Why does the city of Bath features so prominently in your Instagram feed? S dS – Bath is a really beautiful city, a Georgian spa city that attracts nearly five million visitors who come from all over the world to see the architecture, the Roman Baths, the Abbey and all the lovely galleries, museums, parks and shops. I like to show the secret wonders of the city as well as the better known places – my Instagram followers love seeing the city from all of its angles, not just the tourist traps. 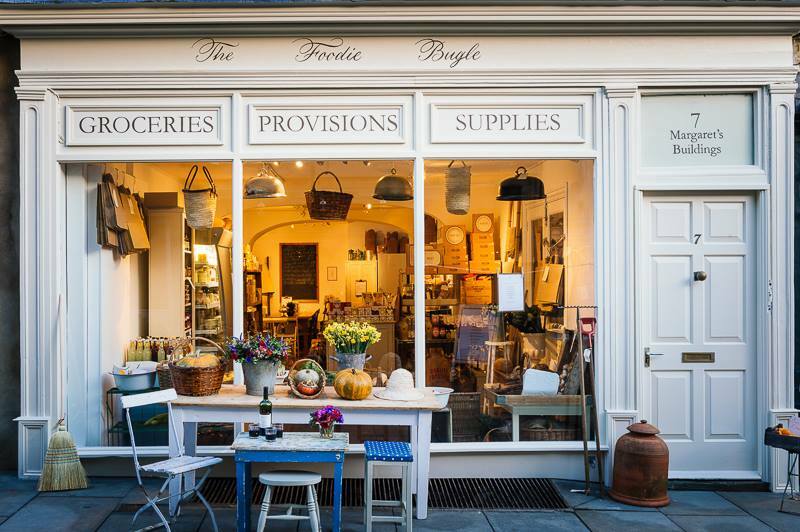 As in many cities, rents and rates have pushed independent businesses away from the city centre, but Bath refuses to be another chain store town. We have so many streets, like Walcot Street, Bartlett Street, Margaret’s Buildings, London Road and Kingsmead Square, where small, family owned enterprises are beginning to make a progressive impact on a sizeable scale. These places are not really on the main tourist map. I use my Instagram platform to show the artisan shops, the small cafes, the private tearooms and the interesting events that are blazing trails away from the centre to everyone around the world. ABOVE: VINTAGE PLATES, WHICH SILVANA IS ALWAYS ON THE HUNT FOR TO USE AND SELL IN THE SHOP, ARE IN KEEPING WITH THE GEORGIAN ARCHITECTURE OF BATH. PHOTOGRAPHS BY THE FOODIE BUGLE. 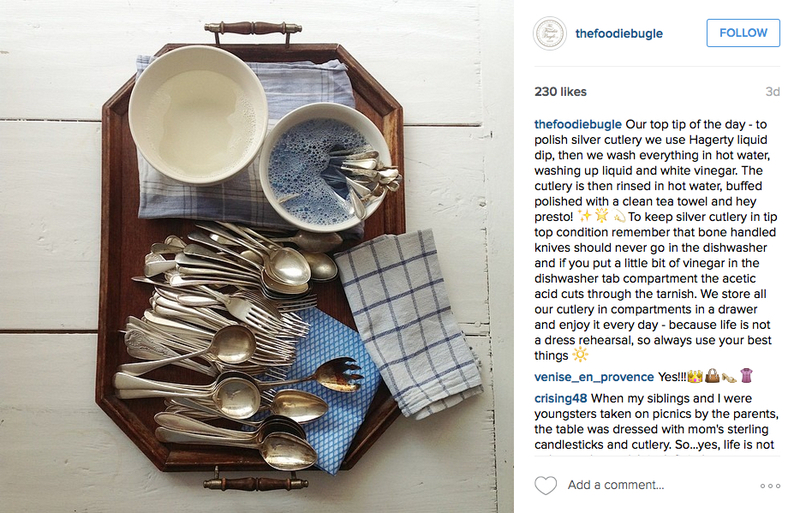 FF – Tell us about how you developed your distinctive Instagram voice? I have an honest voice — owning your own business means facing a tsunami of worry, ambition, risk, hope, expense, joy and more every hour of every day. I tell the truth on Instagram — what it is like to face a day when it rains non-stop and hardly any customers come in, when you spend a Bank Holiday Monday deep cleaning your shop instead of enjoying yourself with your family, when you have to advertise again for a job vacancy because staff have let you down and so on. It is not all pink cherry cupcakes! I like to tell stories — using photographs and words, I love reading other Instagrammers’ narratives, seeing other lives in other parts of the world transported in cyberspace. I suppose I am quite good at it because I love it — and my business depends on it. So many of my customers have come to this shop from all over the world because of my Instagram account. ABOVE: SILVANA SHARES DAILY SHOP KEEPING TIPS ON HER INSTAGRAM FEED. FF – What are your top social media tips? 1. Tell your story, own it and be proud of it. There is only one you, one of your business. Tell the people. What do you do, when, how, why and where? 2. Shoot in natural light, using a simple iPad, against a white or simple background if possible, trying to keep the frame as clean, light and bright as possible. 3. Follow the like minded tribes. There are people in the world who bring oxygen into the room as opposed to taking it out of the room. The naysayers, detractors, narcissists and selfie brigade are to be avoided — follow the tonics, the energisers and fabsters, because your work and life will be richer and happier for it. 4. Promote the work of others as much as you can — good karma goes round in social media and if you collaborate and cooperate it will bring its own dividends many times over. 5. Look at the beauty of the world around you — from fresh produce to herbs, vintage china, cakes, architecture, nature and meals, I am surrounded by beauty all day long. So many of us live in unique environments — show the world your world. ABOVE: AN EXAMPLE OF SPREADING GOOD KARMA ON SOCIAL MEDIA. S dS – At Foodie Towers we wear a very utilitarian uniform: blue and white stripey shirt, blue aprons, flat shoes, hair tied back and no jewellery. It’s a scrubbed look because we are dealing in food. But if I wasn’t working and the means allowed I would happily dress myself in Margaret Howell, Old Town and Carrier Company. I love sturdy clothes, preferably made in Britain, that can stand the test of time, can be worn forever, do not need ironing and make you look like you have just dug up an allotment. ABOVE L: SILVANA PREPARES KALE FOR COOKING. 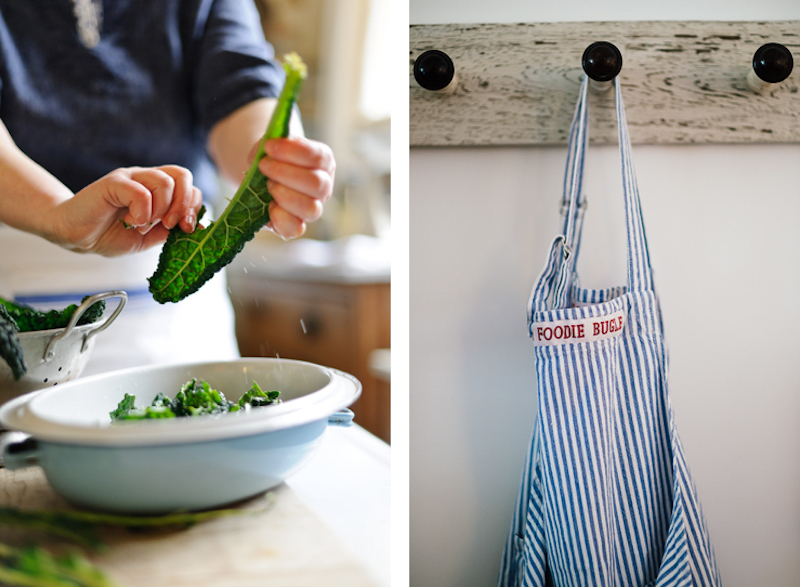 ABOVE R: A FOODIE BUGLE APRON IN CLASSIC BLUE AND WHITE STRIPES. PHOTOGRAPHS BY JASON INGRAM. FF – What’s in your Prescient Pantry? This should be interesting given your shop is a veritable pantry! S dS – My pantry would be north facing, to keep it cool, and it would be very organised! There would be Anna Lisa Tinned Pomodori San Marzano Tomatoes and Cannellini Beans, anchovies in oil, arborio rice and carnaroli rice, cous cous, 00 fine milled Italian flour, Billingtons Raw Cane Sugar, dried porcini, Sardinian olive oil, Tellicherry Black Peppercorns, Isle of Skye Sea Salt, Rummo Pasta in all its shapes, Tupperware containers of my own homemade passata, sourdough loaves made by Duncan Glendinning and The Thoughtful Bread Company, wrapped in hessian bags, Peter’s Yard crispbreads, Ocelot Chocolate, Easy Jose Coffee, Campbell’s Tea and our own Seville Orange marmalade. There would also be an Iberico ham covered in a muslin gauze and a cave aged Westcombe Cheddar by Tom Calver. There, that’s dinner — sorted. 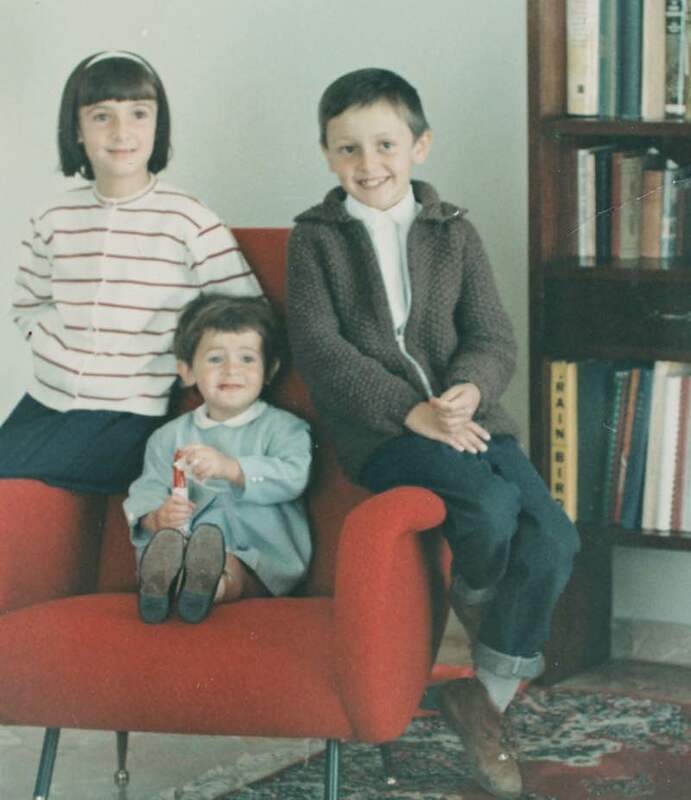 ABOVE: SILVANA (SEATED) AS A YOUNG GIRL WITH HER BROTHER AND SISTER. S dS – I eat plants – lots of them. I drink gallons of fresh water and herbal tea. I eat a little bit of what I fancy every day, in moderation. I do not sit still. I work like a pack horse. I try not to let the darkness, the demons and the detractors get to me by going outside into the light, breathing deep, counting my blessings and being grateful. 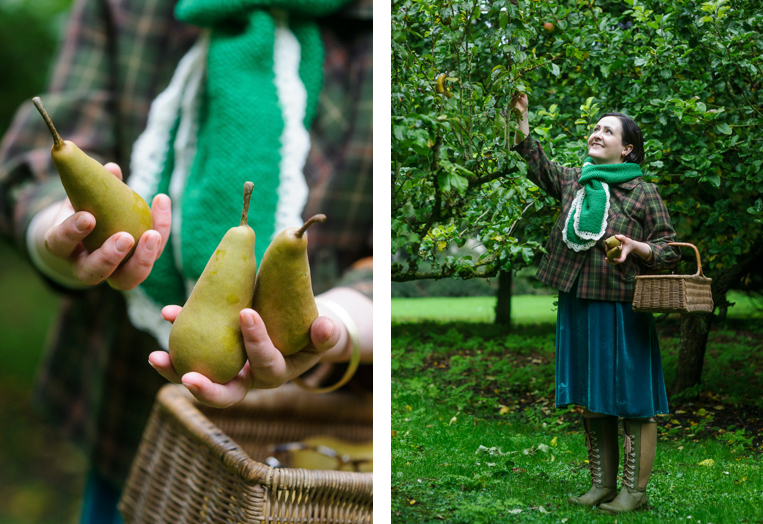 ABOVE: SILVANA ENJOYS AN AUTUMN HARVEST. PHOTOGRAPHS BY JASON INGRAM FOR THE ENGLISH GARDEN MAGAZINE. Above: Amalfi lemons for Silvana. Artwork by Christine Chang Hanway. A Fabulous Fabster thank you to Silvana de Soissons! Very inspiring! Love the positivity and energy about Silvana, and it’s such a lovely place to visit. Great interview, Christine. Many thanks, Celine. Road trip to Bath? Really enjoyed the interview Christine. Must return to Bath for a peek! Thanks, Lynne. Make sure you visit The Foodie Bugle when you do! Thank you for such a beautiful post and such honest, thoughtful questions and answers. My heart is full and nourished to start this early winter morning in Vermont, USA. Hi Marilee. Thank you for writing in. I am familiar with those chilly New England winter mornings as I grew up in Connecticut. It’s lovely to know that you feel nourished by this post. All the best, Christine.